It is vital to let clients know that they are in charge of their own recovery and to give them the self-management and coping skills to make that possible. Client involvement in treatment services is a centerpiece of the recovery model embraced by mental health departments across the country and, of course, an essential component of client-centered services wherever located. In 2002, The California Endowment commissioned Beth Abbott to review consumer and family involvement and make recommendations to TCE to inform its grant-making. The resulting “Consumer and Family Involvement in Public Mental Health Services” provides a very useful summary for those seeking to understand the implications of the consumer movement for policy development and care integration. In addition to providing relevant educational material, some clinics give clients a written behavioral “prescription” containing recommended behavioral changes, referrals and other suggestions about what to do when they go home. Putting these recommendations in writing hopefully decreases the chances of noncompliance and helps clients’ self-management skills. Having the primary care provider directly introduce the client to the behavioral health consultant at the time of the primary care visit. A “warm hand-off” can help confer the trust and rapport the client has established with his/her doctor to the behavioral counselor. In many clinics, the counselor will conduct the initial visit at the time of introduction, if time permits. If not, simply making personal contact has been shown to have a positive effect on subsequent client participation. Making routine reminder calls to all clients prior to their scheduled appointment. Making follow-up calls to clients to find out the reason they didn’t keep scheduled appointments and, to the extent possible, address any concerns they may voice. Clients, often discouraged when prescribed medication isn’t working as hoped or is producing unpleasant side effects, may simply give up. This especially holds true with antidepressants, which generate the most side effects and the least benefits in the first few weeks of administration. Reassurance and/or a change of treatment approaches may encourage re-engagement. SeeStepped Care. Offering evening appointments for clients who may have difficulty getting off of work. Allowing time for “walk in” appointments. Scheduling behavioral health appointments on the same day (if possible) or close to the date of the original primary care appointment that triggered the referral. Using nonstigmatizing language and approaches (see “Reducing Stigma”). Scheduling follow-up visits within two weeks of the original contact and the third and fourth visit within 30 days of the second visit. See Scheduling and Space. Finding out when clients have a regular medical appointment and showing up at that time to catch them. Flagging charts of clients in the integrated care program and asking primary care providers to encourage their continued participation. Inviting clients to phone if they are experiencing medication or other problems. Refraining from postponing client appointments whenever possible. Ensuring that services are culturally competent and that clients can fully communicate with and feel comfortable with their counselors. Offering incentives for appointment-keeping, like transportation tokens. Requiring frequent “missers” to call in to confirm appointments the day before. Reporting no-shows to primary care providers so they can follow up and encourage participation in the program. Retaining a consultant, like a promotora or a current or former client, to encourage participation. Other successful strategies for engaging clients are offered in “Why We Don’t Come: Patient Perception on No-Shows” by Naomi Lacy et al. in the Annals of Family Medicine, Vol. 2, No. 6, December, 2004. Another useful resource is Medscape’s “Best Ways to Deal with No-Shows” published in July, 2009. Involvement of the primary clinic clients need not – and should not – be confined to their treatment interactions. There are any number of ways that clients and their families can assist the clinics by serving as advisors, peer counselors, board members, program planners and promoters. 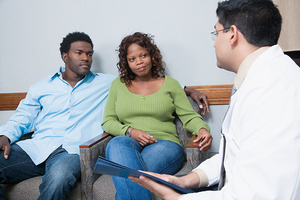 The Institute for Family-Centered Care explores some of these in their paper “Patients and Their Families As Advisors In Primary Care: Broadening Our Vision“.